Preheat oven to 220ºC and grease a 23 centimeter oven proof frying pan or completely metal cake tin - in which you will melt the sugar on the stove top. Peal, core and halve the apples. Pour the sugar into the pan/cake tin and place on the stove top on high heat. When the sugar begins to dissolve, swirl the pan so that the sugar melts evenly. Once the sugar has melted and turned a golden brown colour, continue to swirl until it turns a lighter shade of caramel. It will take approximately 5 minutes. Add the butter and swirl the pan for the melting butter to dissolve into the sugar to create a caramel. When the caramel is a deep brown take it off the stove. If it begins to darken too quickly, put the bottom of the pan into a sink of cold water which will stop the cooking process immediately. Carefully arrange the apples, center side up, on the caramel in the pan. Cut the pastry into a circle just larger than the pan and carefully cover the apples with the circle of pastry. Tuck in the edges and prick the top with a fork. Bake for 20 minutes on 220ºC and then a further 20-25 minutes on 200ºC. Remove from the oven, place a plate on top of the pan and, making sure not to burn yourself, turn the pan and plate over to release the tart onto the plate. Serve warm or cold with fresh cream. 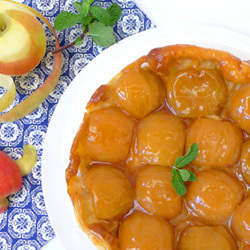 Tip: If you are serving your tart the next day - glaze it with melted apricot jam to ensure a good looking shine. Reprinted with permission of Undomestikated. To see more recipes, click here.